Gel manicures are all the rave right now because they last so much longer then a typical manicure. I get these types of manicures all the time and they do last at least 14 days if not longer! To remove this type of manicure, however, it takes a little more then putting nail polish remover on a cotton ball and wiping it off. Typically you go into the salon and they can remove the polish in a few ways. One way is that they will soak cotton in acetone and place it on your nails and then wrap in tin foil and let it sit for about fifteen minutes. Another way is simply letting your nails soak in a bowl of acetone. Either way then they scrape off the polish as it starts to peel off. The process is a little timely but most likely the biggest inconvenience I found was just having to go back to the salon especially if I was not going to get another color put on. Also I am sure every location differs but there can also be a charge for the removal of the gel polish especially if you are not getting another service done. I was at Walgreens the other day and looking at my really grown out bright coral nails and decided to try an at home gel polish remover. For $6.99 you got 4 packets in which one packet could do both hands or both feet (although I think you could do both your hands and feet from one packet). Anyways it says to tear open the packet and firmly place your nails on the acetone pad and two minutes later rub your fingers back and forth and it would come off. This review is a mixed review because I will definitely buy this product again but the directions are not totally accurate. First you need to firmly press your nails on the pad for a good eight minutes when you remove them the gel polish is all peeled up and I simply took my nail from my other hand and lightly scraped the polish off. It was really pretty simple. Also the packet contains aloe in the formula which is good for your hands and nails. The polish came off with ease but I highly suggest letting it soak a lot longer then what the directions say and scraping it off instead of rubbing. 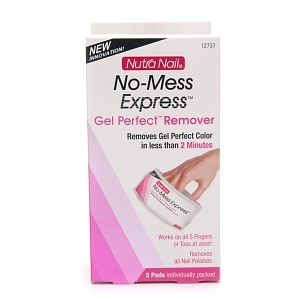 Bottom Line: Save time and money and take off your gel polish yourself with this product!